A kitchen remodel or makeover not only adds value to your home, it will almost feel like you’ve got a new home. Here’s 4 ways to bring your dream kitchen to life. First, sit down and crunch some numbers. With $5,000, you can spring for a fresh coat of paint, replace faucets, pick up a new light fixture and spruce up the area with some modern accessories. With $15,000, you can also buy a new appliance or two, replace your countertops and install new, budget-friendly cabinets. If you’re planning on spending more, you might be able to redo your entire kitchen. When determining how much to spend, remember that recently remodeled kitchens return between 80 and 105% of their cost when a home is sold. Cabinets with wood panels and solid wood frames are sturdy, budget-friendly and fashionable. Porcelain-tile cabinets are a fantastic new option that look almost exactly like wood for half the price. 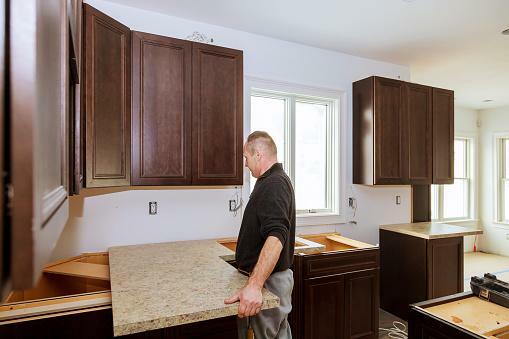 Laminate is your cheapest option for cabinets. It’s durable, easy to clean and comes in a variety of colors and patterns. Refinish the outside of your cabinets instead of replacing them for a new look that doesn't bust your budget. Replacing your sink’s faucet, bowl or hardware can modernize your kitchen without costing much. Brushed nickel is the most popular choice for faucets right now, largely due to its durability. The least expensive faucet finish is chrome, while brass is another long-lasting, economical choice. Farmhouse bowls are super-large and deep. On the flip side, their large size means they often require a customized base cabinet for installation. Top-mount bowls have a “drop-in” rim that keeps the sink in place. This makes installation simple, but creates a prime place for dirt to gather. Undermount sinks are trendy and look sleek, but can take double the installation time. The trending countertop choices are granite, quartz and stone. These materials are beautiful, easy to maintain and can last for years. If you need something more budget-friendly, you might want to go with ceramic tile. It’s durable, comes in almost any imaginable color, and is a fraction of the price of stone. Another great option is laminate. It’s easy to install and is also available in many patterns and colors. Lastly, consider going with solid wood. You can have it sanded and treated to give it an extra long life, and it will give your kitchen a warm finish. Longing for an upgrade and short on savings or cashflow? You can still have your dream kitchen. Call, click, or stop by MCCU today to learn about our Personal Loans and Home Equity Lines of Credit. These low-rate loan options will keep your payments low, and your kitchen looking great! Your Turn: Have you recently remodeled your kitchen? Tell us what money saving options worked for you in the comments!